Turkish men aged 27 years old and over who wish to skip their military services started to apply to military recruiting offices for exemption on Monday. The Turkish parliament approved a bill on December 3, which enables men born after 1 January 1988 to skip their compulsory military service by paying 18,000 TL ($8,103). Accordingly, many people wishing to utilize the new law visited the recruiting offices early on Monday morning, after having paid the arranged amount. 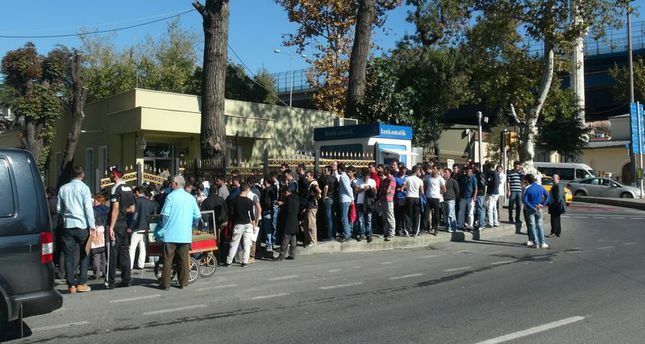 One person waiting to hand his documents to the officials at one of the recruiting offices, reportedly said: "The queue is long, we are all waiting for our turn to come." There are reportedly 800,000 people who will be exempted from military service in accordance with the new law. The deadline for applications has been announced as 13 February 2015. Men of any age who cannot undertake their military service due to various health problems will also be able to benefit from the law. According to the findings of Parliament's Research Center, 125,834 people have benefitted so far from paid military service regulations in Turkey. Such regulations have been made four times previously, with 67,630 people benefiting from the regulation in 2011, 72,290 people in 1999, 35,111 people in 1992 and18,433 people in 1987.